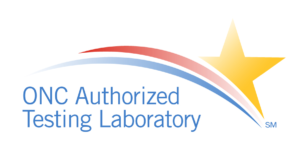 SLI Compliance® has been authorized to perform Conformance Testing and Certification of Health IT by the US Department of Health and Human Services’ Office of the National Coordinator as an Authorized Test Lab (ONC-ATL) and an Authorized Certification Body (ONC-ACB). Testing and Certification ensures eligible professionals, practices and hospitals that the Health IT technology they’re considering has the necessary capabilities to satisfy the ONC Health IT Program criteria and CMS incentive program goals and objectives. Have questions about testing and certification? We have answers! Visit our FAQs page for answers to some common ONC Health IT Program questions. Establish criteria for qualifying technologies. Efficiently identify your system scope and define process starting point. 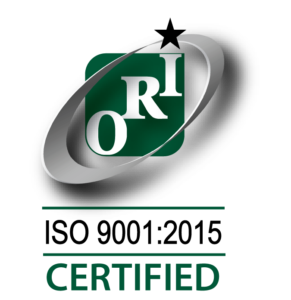 Provide clear understanding of the ONC Certification Program requirements. One-on-One subject matter expert resource consultations. Perform customized system Pre-testing to provide crucial feedback, associated risks, and a level of confidence for your systems. As program rules and requirements change, vendors may need assistance in testing to ensure their product meets the necessary criteria for certification. 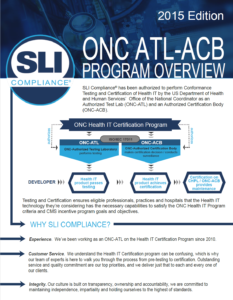 SLI Compliance can help vendors gain a high level of confidence in their product(s) and assist with verifying conformance to the ONC Health IT Program criteria by performing an Independent 3rd Party Verification. 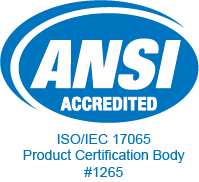 SLI’s knowledgeable staff can provide 3rd party testing against the approved ONC criteria, provide valuable feedback and help vendors understand exactly where their product stands. 3rd Party verification is independent of testing for ONC Health IT Certification but will provide you with the necessary information about your product and assurance the product is ready for certification. Experience. 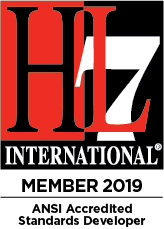 We’ve been working as an ONC-ATL on the Health IT Certification Program since 2010. Customer Service. We understand the Health IT Certification Program can be confusing, which is why our team of experts is here to walk you through the process, from pre-testing to certification. Integrity. Our culture is built on transparency, ownership, and accountability. We are committed to maintaining independence, impartiality and holding ourselves to the highest of standards. Contact us today to achieve your ONC Health IT Program goals!